In all the excitement about 3DS price drops and free download games, don't forget your old friend the Nintendo Download. Here's what's available in North America later today. Let's Golf! 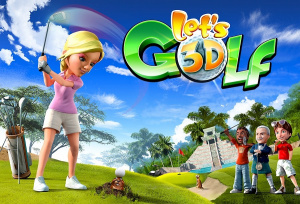 3D (Gameloft, $6.99) — The eShop's first properly new downloadable game, Gameloft's golfing game features six courses, eight characters and 108 holes in total. We'll take a swing at a review in the coming days. Brawl Brothers (Super NES, Jaleco, 800pts) — A decent side-scrolling beat 'em up on a service that's approaching maximum occupancy of that particular genre, tussle with our Brawl Brothers review for an idea of whether this game is worth your points or not. Burn the Rope (Big Blue Bubble, 1000pts) — The popular iOS game comes to WiiWare with high resolution graphics, Wii Remote motion controls and over 100 levels. Our upcoming review will let you know if it justifies its pretty hefty price tag. My Australian Farm (BiP Media, 200pts/$1.99) — Strewth mate, a farming game set Down Under! You start with an emu before expanding your farm, hopefully even including a kangaroo to tie down. Expect more incisively employed Australian stereotypes in our future review. GO Series: Portable Shrine Wars (Gamebridge, 200pts/$1.99) — Carry a shrine on your back, charge past others doing the same and fling your teammates at them to become the best portable shrine carrier there is. Mad we know, but then it's a GO Series game. Our review's coming soon. Oscar's World Tour (Virtual Playground, 500pts) — A surprise fourth entry in the Oscar platforming series, this sees the little tyke travel the world over seven levels, collecting baby Oscars. We'll dive into a review soon to see if it's — wait for it — Oscar-worthy. Who's picking up what today, then? Same 3DSWare? Nice, but no VC for the second time for you lot. Durr hurr. As an Australasian, I feel I am allowed to cute doggy at the Australian Farm description. Is 'burn the rope' similar to 'cut the rope'? No Gameboy games two weeks in a row? No VC is so fail (again). Nintendo must be saving it all up to blow that big hot load of 20 free games. I'm sure there'll be more, why wouldn't there be? The others are great and it can't be that hard to add another layer of code for an ancient game thats a quarter inch to one side, and maybe a new menu. I kind of hoped the oscar thing was meaning oscar-the-grouch, not this cheap looking platform thing. It looks more like one of those unlicensed mario knock-offs from the old NES days. Just curious, is there going to be a Bobby Carrot Forever review? Nothing for me today. The golf game kinda seems like shovelware at first glance to me, but I could be wrong. I'll wait for the review and see. As far as VC goes, it's certainly not dead, folks. Don't be so silly. As someone who actually has to pay his money (and not mom and dad's) for these games, as well as paying actual bills in excess, I'm glad they're not overloading my wallet with Mario Lands and Metroid IIs and Kid Icarus:OMAMs right now. Still yet, next week I'd really like to see a good VC title. Did the August Japan VC list come out already? I'm not bothered by the lack of 3DS VC. Nintendo is just purposefully taking some hiatus' early in the game this time so people don't run for their torches and pitchforks in a couple years like with the Wii VC. Now as for today's download, I'm happy there is finally a proper 3DSWare download but I'm still on the fence for buying it....at 5 dollars I'd do it but at 7....this'll take some thought. I get it now. They're only going to release 3DSWare or 3DS VC in a single week going by what they did this week and last week. If you want more 3DSWare, you have to sacrifice your 3DS VC games. And Brawl Bros. isn't really a great game but had to be released at some point. I'm glad they're not overloading my wallet with Mario Lands and Metroid IIs and Kid Icarus:OMAMs right now. You don't have to buy them as soon as they get released. Even if they did release several good games in quick succession, you can be happy knowing that they are released for when you can buy them. Yeah, but if they released them all at once, I would surely buy them. It's too tempting. sigh Nothing for me here. Well, back to waiting for Metroid 2, Super Mario Land 2, Wario Land 1-3, Mole Mania, Mega Man I-V, Kirby's Dreamland 2, Super Mario Bros. Deluxe, Zelda Oracle of Ages/Seasons, Shantae, Kirby's Star Stacker/Pinball Land/Block Ball/Tilt 'n' Tumble... and that's only on the Game Boy front. Lets Golf is 1500 blocks! @Oregano: That's a lot! Hopefully its also a sign of things to come for 3DS downloads. Certainly puts the DSiWare download cap to shame. I believe the biggest DSiWare game I've ever seen was like 130 blocks. I also hope online play becomes more of a standard thing for downloads. I've got just as many problems with Gameloft as the next guy but I'm happy with where they are starting 3DS downloads at. Yeh, I hope more games are online in the future. It's a bit of a shame Lets Golf doesn't have online whilst the iphone version does. I think Ill give this golf game a go. The preview video made it appealing. No 3DS VC again for the second week in a row. What say you, people who always feel the need to defend Nintendo over every single little thing? @Oregano: What!? The 3DS release doesn't have online?? It was my understanding that it did! Where did you hear this from? @MrDanger: I say, relax, the good games will come out in good time. Be happy they aren't drying up all the huge games right out of the gate so they can stretch the 3DS VC out better than the Wii one. I say what I said last week. If a great game came out every week, would you buy it? @bboy2970: It's right there on its info page it only has two player which is done by handing the system to the other person... I'm not even sure it has wireless local. Yes and I have so far. @Oregano: Well that's a bit disappointing... Not too big of a deal to me personally though since online golf games are usually too long for me. Still would have been nice to have the option though. I need Double Dragon for my Gameboy collection. @bboy2970: I'm playing the game now, looks very nice but gameplay is a bit simplistic. Now do you believe that a majority of people would? I would love to have all the VC games released at once and just make WiWare/DSiWare/3DSWare the weekly releases, but some where someone has decided they make more money by spreding it out, and mixing up the types of games. Wait....the eShop update already happened in Europe?? Lucky! So is the game like...pretty good? As long as there isn't anything glaringly wrong with it I'll get it. Also, do the in game graphics look like they're bumped up from the IOS version or about the same? 10 free Gameboy Advance Games makes up for the lack of GB VC. @bboy2970: The full update doesn't appear to have happened yet but Lets Golf was made available to purchase. It seems like good fun so far and I'm not that familiar with the iphone version(only saw trailers/screenshots) but it appears to look pretty much identical. An australian game? Hopefully it contains extremely dangerous killer wombats, drop bears, assorted dangerous snakes and spides and kangaroos as a form of locomotion. How odd that its available right now there. It isn't yet in the NA shop Thanks for the early opinion of the game. I think I'll get it come noon Oh, one more question, is there some type of career or goal or something that give the game legs or is it just kind of "here are these courses, have fun!" Yeah there's a career mode and you have to unlock characters and customisation options. Lets Golf was put in the shop last week here but said "coming soon to the eShop" which was changed at 2pm. It took a while to download with its gigantic size though! No 3DS VC again. Hmmm...and Nintendo wonders why their online service doesn't perform as well as they would like. Still waiting for Double Dragon and Adventure Island 2. Argh so Lets Golf does not have online. That would have sold me for sure. Another sucky VC week, I guess I'll just go back to My keyboard pillow of bored times. Why is it that everyone always seems to care about just VC. We got an actual 3DS downloadable title for the first time. That's a big deal and although it's nothing amazing, it isn't shovelware. We also got 3 DSi games and a Wii VC title. There's more to life than just playing old games. Nothing here worth purchasing today. Come on Nintendo, 3DS VC is barely even started and you are already neglecting it - I want my WarioLand 3!!! Maybe Portable Shrine Wars, but that's about it. And no new VCH games in two weeks. At least I'll be an eShop Ambassador!!! Nothing interests me this week. Sorry, Nintendo - try again next week. Bleh, nothing interesting for me this week. The Japanese VC list still is updated the last Friday of the month. They don't do 3DS VC games when they have a 3DSWare game to promote. I had a bad feeling we wouldn't be getting a 3DS VC game this week. At least we got a Wii VC game. Too bad it's a crappy beatemup. Oh well, at least it's one game closer to Adventure Island II. They are taking a break from VC for a while. I can't wait to try out Let's Golf. Insta-buy. It is available. You have to search for it by typing it's name or tap the "What We're playing" shelf. Well I tried to resist for the time being, but I went ahead and downloaded the Let's Golf! 3D game. I was weak, I know. Burn the Rope is a decent iOS game isn't it? Lucky Americans. So turns out Let's Golf 3D is really fun, and simple. Worth the $7. No 3DS VC again, this early in it's existence? WEAK!!! Even the dying/dead Wii gets a VC game every other week (including this one). May get Brawl Bros.. Love the good old Final Fight-style beat em up that the SNES was KING of (everybody with a SNES should get the superb Batman Returns any way they can... maybe best movie-to-game ever). Please please stop the DSi shovelware!! There's SO much that it made the DSi store unusable. It's completely flooded the 3DS store, but its a little easier to sift through it now. Bring some high quality 3DSware instead! btw, something I noticed (that may or may not've been mentioned by now... I didn't see) is that they didn't use the 3DSWare moniker for Let's Golf. Like Xevious and Excitebike, it says "Nintendo 3DS (Download)". So, makes you wonder if Nintendo's completely abandoning the -Ware for their original download titles starting now. The obvious menu lag aside, Let's Golf 3D is pretty good so far. Me = sad. I can't wait to get those free games though. I guess it'll be worth the wait. I don't torture kittens, but if I did, this would probably be the reason. I got some points on my Wii and still nothing good to spend them on! @sam: Nope but don't let that deter you. This is a really fleshed out great package with very long legs. I've been playing it for over 3 hours and have 25% of the challenges done, 15% of achievements gotten, and just 10% of career done. The gameplay is fairly smooth and the game is quite fun. Plus for your multiplayer fix there is a 2 player mode on the same system, you just pass it back and forth. No online is a shame but the game is still worth every bit of 7 bucks. @bboy2970 So is Let's Golf 3D just a port of Let's Golf 2 then? "They don't do 3DS VC games when they have a 3DSWare game to promote." Why not promote both of them. @JJOR64: Well I have never had any experience with Let's Golf 2 but from what I've read, that does seem to be the case. Its essentially the IOS version of Let's Golf 2 + button controls + 3D - online play + local same-system 2 player. Also I believe this game is 2 dollars more than the IOS game. I think the pluses and the minuses of each weigh each other out nicely. Definitely a worthy game IMO and a great start to 3DS Downloads! @bboy2970 Agreed. This is a great start for 3DSWare. I can tell that Nintendo is trying to improve on the goodness of the games. This is packed with content. @bboy2970 It is a bummer that the online got taken out, but oh well. Definitely going to get this when I get off work tomorrow. They want 3DSWare to sell. Why promote something that would take away sales? I can't wait until I buy myself a 3DS pre-paid card so I can buy Let's Golf 3D. IGN gave this game a 9/10. It has everything the iphone(or ipod, I can't remember which one it's on) has in it except for the online multiplayer but there is alternating multiplayer on a single 3DS. A lot of you are complaining about the lack of VC games. Why? The shop is still darn well new, and may have at least 24 months in it. That's more than enough time to pleasure your VC needs. If you are disappointed by lack of GB games then please... Buy a Wii and get your fix that way. I didn't realize Nintendo was promoting any of their downloadable outlets.